It’s finally spring and FINALLY time to start pulling out the dresses and sandals! To celebrate the warmer weather, Shopbop is hosting it’s event of season! This sale offers the PERFECT time to snag new warm weather pieces or that designer piece you’ve been eyeing! Get 20% off orders under $500 and 25% off orders over $500 with code EVENT19. Check back tomorrow to see the pieces I snagged and some of my closet favorites that are on sale! I’m sure by now you have heard PLENTY about the Nordstrom Anniversary Sale! You know what it is and my favorite picks, but after yesterday’s kickoff, it’s obvious what everybody is loving! These top selling items will be the ones to go first, and it’s no wonder…fall staples on sale?! Yes please! You might notice that a few of these were on my first look picks yesterday! 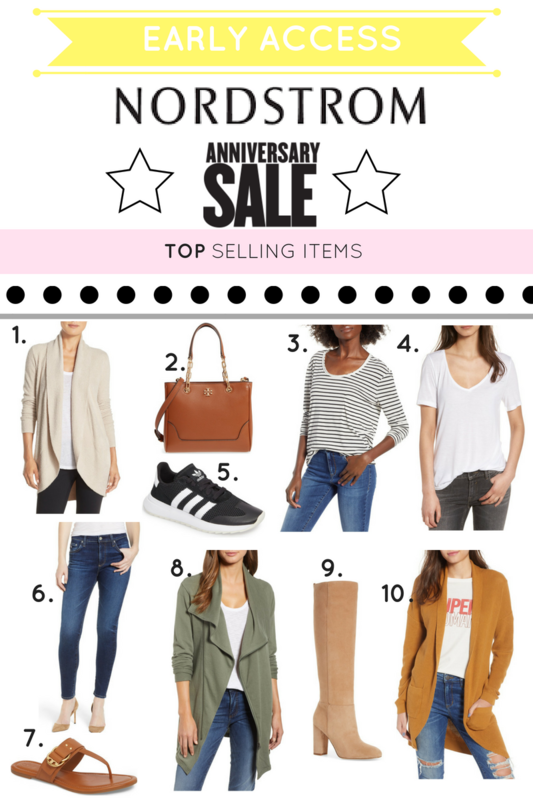 Below the top selling items, I am rounding up my favorites from each category of the sale (more to come throughout the day)! Just click the product photo to shop! PS Make sure to make it all the way through this post for an AMAZING giveaway!! Barefoot Dreams Circle Cardigan ( NOW: $77 // AFTER SALE: $116): I have yet to get my hands on a Barefoot Dreams cardi, but am happy to say it was the first thing I ordered this year! This always sells out within the first few days of the sale and is highly rated. I can’t wait to get my hands on mine!! 2. Tory Burch Tote (NOW: $323 // AFTER SALE: $498 ): Now is the best time to get hot ticket items, like Tory Burch, at a discounted price. Tory Burch bags are classic and high quality. I am loving the size of this one and that it can be worn as a crossbody. It comes in 3 colors, but I love the cognac for fall (and year round, if I’m being honest!). 3. BP Scoop Neck Tee (NOW: $19 // AFTER SALE: $29 ) & 4. Raw Edge V Neck Tee (NOW: $12 // AFTER SALE: $17): I’m putting these together because they are closet staples and a total steal! I stocked up on a few colors in both styles. I actually already have a few of the short sleeve tee’s and they are my FAVORITE! I highly recommend snagging a few of these before they sell out (because they will!). They are perfect to wear now and layer up when it gets colder! 5. Adidas Sneakers (NOW: $68 // AFTER SALE: $90 ): It’s rare to find great sneakers under $100 and these are under $70!! They come in two colors and are sure to sell fast! Wear them to the gym or while running errands. I ordered a pair!! 6. AG Denim (NOW: $150// AFTER SALE: $225): Last year I splurged on the AG jeans during the sale and am so happy I did! One of my favorite pairs of denim, these are super comfortable, flattering and easy to move in. Teacher friends, if you are looking for denim for the classroom, these are definitely worth the splurge! 7. Tory Burch Sandals (NOW: $150 // AFTER SALE: $228): This is not a fall find, but something you can wear now! I own two pairs of Tory Burch sandals and love how comfortable they are! I love the buckle design on this pair. They come in 3 colors and I currently have the white in my cart! 8. Caslon Asymmetrical Jacket (NOW: $53 // AFTER SALE: $79 ): This jacket is perfect for fall. I debated on getting this in green but before I could pull the trigger it sold out in my size and I am so bummed! I will definitely be checking for restocks on this one, but might snag it in another color! This would be so cute with tee and leggings or denim. I also think this would become one of my teacher wardrobe staples…okay, I think I definitely need this one! 9. Sam Edelman Caprice Boots (NOW: $150 // AFTER SALE: $225 ):These boots are gorgeous and at the top of my wish list. They have the perfect stacked heel and I love all of the color options! I have a similar pair of boots that I wore all last fall and winter. They are perfect to take from work to the weekend! 10. BP Curve Hem Cardigan (NOW: $32 // AFTER SALE: $49): The top selling item from last year is back and better than ever with an updated look! This sweater is a STEAL at just $32! I bought it in 2 colors last year and wore it repeatedly, so of course I snatched it up in a few more colors this year! This sweater is the perfect length for layering and one of my favorite pieces for work in the fall and winter! This will sell out before the end of the weekend, so snag one, or maybe two, while you still can! This giveaway runs until end-of-day 7/20 at 12AM EST. IT’S HERE! 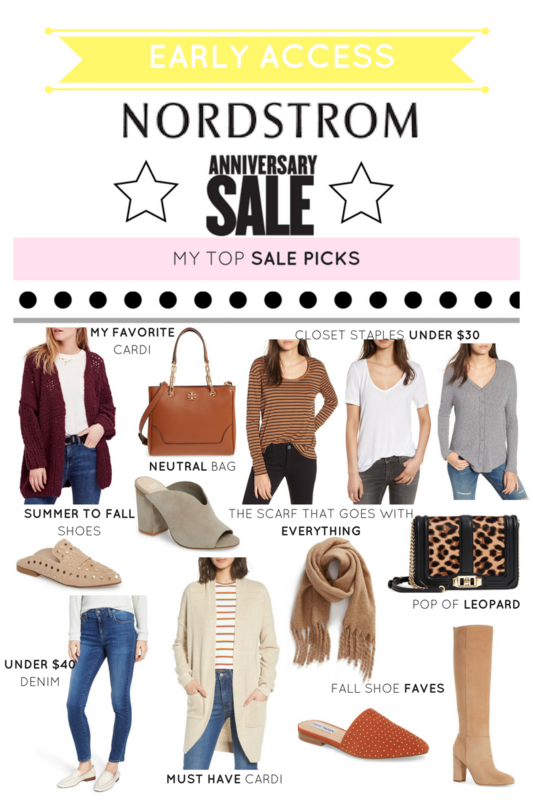 The Nordstrom Anniversary Sale early access has begun! Starting today, cardholders get early access to the sale of the year…NEW fall arrivals at discounted prices! The sale opens to the public on July 20th, but if you want the hot ticket items (think NEW Tory Burch riding boots, Rebecca Minkoff bags, AG Denim ON SALE), it’s important to take advantage early!! Check out some of my tips for navigating the sale and scoring big! 1. SHOP, SHOP, SHOP – This is a huge one and something I always do every year! Hot selling items will go fast (Nordstrom anticipates some being gone within 24 hours!). Order early, try on in the comfort of your own home and keep what you can’t live without. Remember, Nordstrom has free shipping and returns! Because I live almost 3 hours from the nearest Nordstrom, I find that this works best for me! I already placed an order (and will probably place a few more before the end of the sale, if I’m being honest), and plan on trying everything at home to determine what works for me. I even snagged a few items that I was on the fence about because I can’t tell you HOW MANY TIMES I have debated a purchase only for me to decide I did want it just as it sold out! Find out sale details an how to become a cardholder HERE so you can get access to all the goodies before they sell out! 2. MAKE A LIST (and check it twice!) – While I firmly believe in buying more and returning what you can live without during the sale, I also think it’s important to not go overboard! I mean do you really need the North Face down parka coat if you live somewhere that rarely gets below 50 degrees? Just because it’s a great deal doesn’t necessarily mean it’s a must buy! I’ve too often been tempted to purchase items I really don’t need, so now I always go in with a shopping list! Write down the items you are looking for and keep your eyes peeled for good deals in those categories! 3. GET FAMILIAR WITH WHAT YOU ALREADY HAVE – Spend some time looking over your wardrobe before you shop. Not only does this ensure you don’t walk away with items you already have, but it also helps you find pieces to incorporate into your closet! I can’t tell you how many times I’ve eyed something only to realize I have an almost identical version at home! I have also used this trick to find pieces to style with items already in my closet. One of my favorite things to do is look for fall accessories that I can pair with some of my easy summer dresses. It’s so easy to turn a summer tee dress into a fall appropriate look by pairing it with a cardi, scarf and some boots! Below I an rounding up some of my favorite picks throughout the day! I will do more detailed posts throughout the sale, including a review of my purchases. Because I don’t live near a Nordstrom, I expect my online order to come in a few days and can’t wait to start sharing what I got with you! To shop the below picks, just click any picture to head to the product page! I will be updating this post throughout the day as I continue to shop the sale, so make sure to check back! 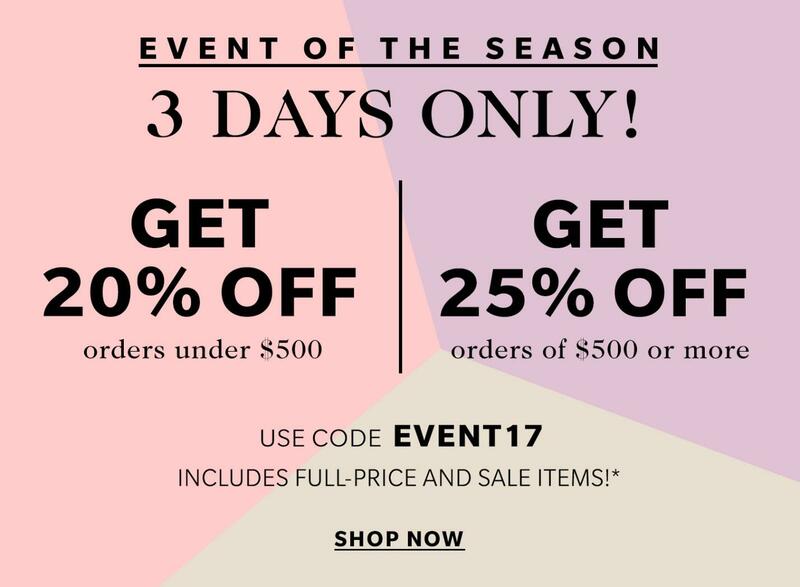 Shopbop 3 Day Sale Event! One of my favorite online retailers is currently holding a 3 day event. Get 20% off orders under $500 and 25% off orders of $500 or more at Shopbop. It’s the best time to stock up on new summer goodies like dresses, swimsuits and bright accessories or splurge on that designer piece you’ve been eyeing! 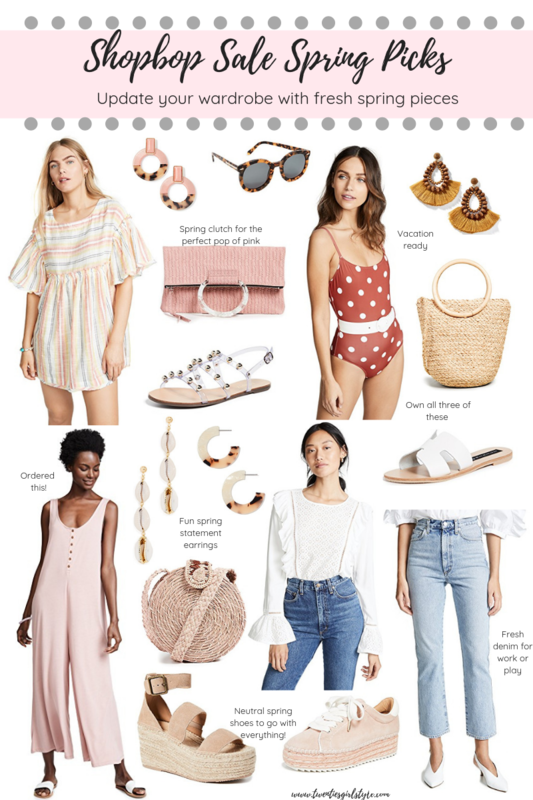 I’ve rounded up a few of my favorites below, some of which are already in my closet (I also picked up a few new pieces for this summer!). Just click the link below the collage to shop!! Do you plan on picking something up or did you already do some damage? Let me know!